OK, going to be a bit of a mammoth update, this one – got two weeks of babbling to catch up on! Right, so Id booked off the 9th November as holiday. Id not done any biking the previous weekend, as I was trying to rest up and get rid of my cold (which was an epic fail plan, still feeling rough now!). But I felt a bit stir crazy, so after dropping off Mr Toast at work, I headed to the Chase, Professor in tow. OK, very slowly, I managed just over an hour by only stopping for five minutes. Some of the trail was quite churned up on the later sections, with section 15 being particularly muddy. Still, as I’ve said before, if you’re adverse to a bit of mud you should probably find another sport! Went to the cafe, had some cake and a cup of tea, then got back on the bike. Pootled around the greens for a bit, then hit FtD for my second lap. The cunning plan was to ride FtD up until 13, do the full green loop, return to 13, and finish off the Dog. It would be quite an epic day of riding for me, as I’ve not done that since the summer – normally because by the time we arrive at Cannock Chase in the winter we only have a few hours of daylight left! There were numerous thoughts that hit me at the same time. “Ooh, I’m here already”, “Ah, I’m approaching this at a slightly tight angle”, and “I haven’t got my weight back enough”. Unfortunately, my reflex “BRAKE!” reaction kicked in, and I stopped dead with the front wheel down and the back wheel still on the top step. Went to put my right foot down, couldn’t reach, got monstrous cramp in my calf, and toppled right. I pondered trying to carry on, but I was worried that I’d get halfway over Sherbrook Valley and the adrenaline of having a tumble would wear off and I’d realise I was actually a bit battered. Sat around for a bit, and realised that breathing was actually a bit painful, coughing even more so. Decided to give it up as a bad job, and went home sulking. I try and remember how much fun the first lap was, but my ribs still sting a bit even now! On the 15th it was the last Big Build Day of the year, and despite the dire warnings of heavy showers, the weather was fairly reasonable. There was a good turnout of people, letting us build a good chunk of track. Toast and I turned up fashionably late, and had to locate the trail builders by ear – listening out for stomping, shovelling and sawing! Dale and Sharon provided the food again, with delicious chilli and cheese jacket potatoes. Progress was so good that we managed to finish off the bit of the trail that had been scheduled for the day, and move onto the next! Hopefully Phase II will be on schedule for its Easter opening, but it will need people to make it happen – next Big Build Day is on January 4th (I think), and obviously there’s the standard build days every Sunday. 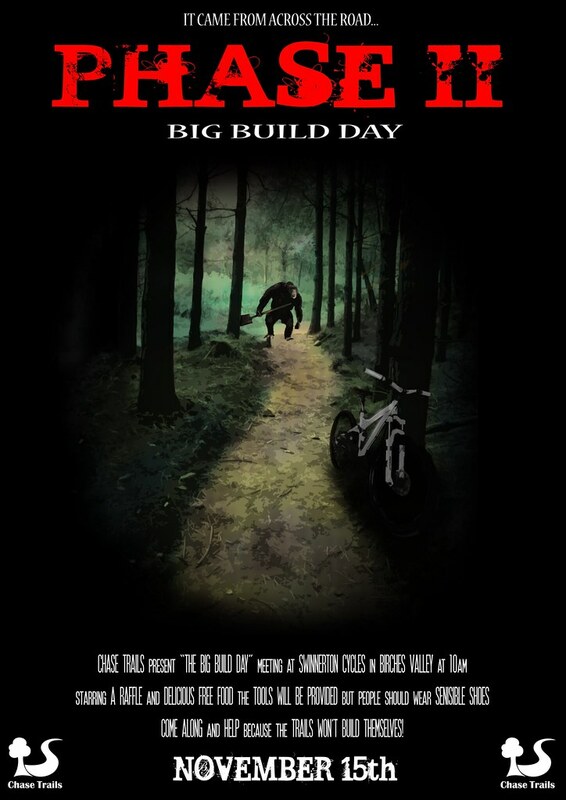 This lurgy’s still knocking me around a bit, so I’ve spent most of today sleeping, eating, starting to write a guide to Follow the Dog, and working on a new poster for the next Big Build Day. Not sure how coherent my FtD guide is either, I’ve been a bit spaced out today. Nothing a nice cup of tea won’t solve though! This is the 100th post! To celebrate, I actually went to the doctors, just like I said I would! Turns out it’s bronchitis. On the plus side, I have delicious antibiotics now, which will hopefully make me feel better by the weekend! Went biking yesterday with Mr Toast and Ovide in tow. Ovide’s an interesting chap – doesn’t ride that often, and has a low end GT Avalanche that’s slightly too big for him with a terrible, terrible fork. Yet the guy goes like a bat out of hell and has no fear, and goes straight over things without pausing – including Evil Root Number One! 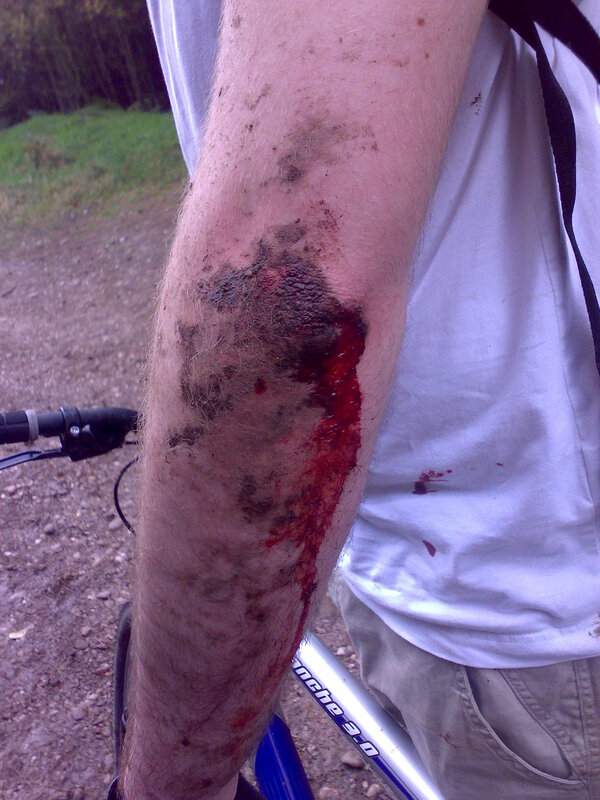 Trail conditions are a bit slippy at the moment thanks to the recent downpours, which left me very nervy on corners. I went slowish but steady, my fear of falling off outweighing my desire to wheel buzz the boys. Watching Ovide’s wheels shoot sideways every now and again didn’t do much to encourage me, even if he seemed relatively unfazed. Poor sod came a cropper on 10 though. The three of us set off, and Mr Toast and Ovide raced off. I was riding at a respectable pace (honest! ), but I thought I saw and heard someone behind me. I carried on until I could find a suitable place to pull over and let them pass…and there was no-one there. Wooooooooo, spooky. I waited for a minute or so, decided I was obviously going mental, and carried on. Shortly after I caught up Ovide, which surprised me. He was right behind Mr Toast before, and quite ahead of me. Obviously I’d managed to ride with BLAZING SPEED and radically decreased the gap between us! Or, Ovide had skidded out, caught his handlebar on a tree, and had been sent flying from his bike. That could have happened too. But fear not, for Ovide was able to resume the ride, after cleaning the wound with…cranberry juice. It wasn’t a bad cut, just ‘a flap of skin that keeps on bleeding’. Finished the ride in decent time without further incident , and a good time was had by all. Huzzah! I’ve still got a really nasty cough which makes it hard to breathe sometimes, and I’m still a little phlegmy. I should probably see a doctor or something, but in the meantime I have Gray’s Herbal tablets. They obviously have awesome medicinal properties, because they have an airdale terrier type dog on the packet. Post ride food snaffled: Tea and a slice of cake. Asked for lemon, got coconut, bleugh. Good dogs seen: Much better this week! Quality Russells of both the long and smooth haired variety, two huskies, a beagle pup, and a demented border collie that wanted to get a bit too facially-familiar with Ovide’s nether regions.